In an interview with Fiction Writers’ Review, Jacinda Townsend shares that she tackled the writing of her novel in spurts, between her daughter’s naps. Toni Morrison wrote her first novel, The Bluest Eye, like this, too, in between her full time teaching job and parenting her sons alone. 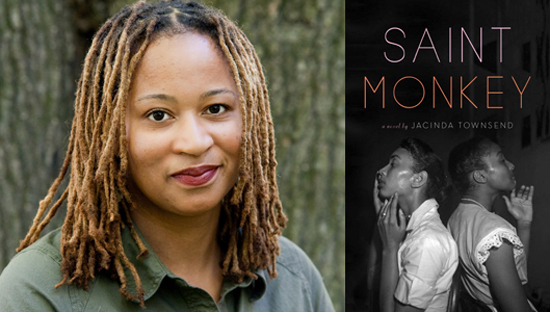 The comparison of Townsend to Morrison is appropriate; like The Bluest Eye, Saint Monkey, Jacinda’s debut novel, is a mature, coherent and well-articulated work of art that announces the arrival of an important voice in contemporary literature that isn’t timid about creating a nuanced portrait of black America or centralizing the stories of women. Two black teenaged girls, Audrey and Caroline, are the protagonists of Saint Monkey and the story is told in alternating points of view as they grow up in Eastern Kentucky during the 1950s. The fifties, with all of its layered, complicated beauty, is a fascinating time in the history of black America to mine–the wealth of the post-war era has started to trickle down and Jim Crow is on its way out, courtesy of the black institutions that have been growing in influence since emancipation. Audrey and Caroline are neighbors in a multi-class yet insular African-American community and Townsend is more than convincing at creating this world. The girls develop an uneasy friendship based on their common misfortune. Caroline is unattractive and dreadfully poor. Audrey is unattractive also and, though a little better off financially, she’s socially awkward and obsessively bookish. Circumstances collude and both young women lose their mothers. The young women are also ambitious in an even-keeled way about both love and professional fulfillment. One would be remiss, I think, to characterize their dreaming as “romantic.” This shared, steely ambition is another of Townsend’s artistic choices that keeps the story authentic. The two young women dare to expect happiness in spite of the calculus of their misfortune. Caroline dreams of escaping to Hollywood. Bookish Audrey is a precocious and mathematical pianist, an obvious talent that helps to break her out of her humdrum existence. While stirring her congregation during a funeral service, a talent scout hears her playing and offers her a job in New York, which she accepts with the begrudging blessing of her family. Caroline stays behind in their small town, leaping from man to man, struggling to make ends meet to care for her grandmother and little sister. As each heroine’s life twists and turns, the reader is encouraged to decide who is better off. It’s thrilling to consider and a surprisingly difficult judgment to make. Of course, Audrey, whose fast-moving, glamorous musician’s life of gigs and casual interactions with Thelonious Monk and Ella Fitzgerald would appear to be obvious choice. But Townsend is much too skilled a storyteller to adhere to the clichés of small-town black pathology. Sure, Audrey is swept up into the current of Harlem at the height of jazz’s popularity and inventiveness and experiences a whirlwind romance, but does she possess the footing and fortitude to sustain this? Does she have the resources, internal or external, to overcome obstacles and make something lasting of her chance? Caroline is shamed by her decision to stay home in Kentucky and meets her share of hard luck, but she possesses an earthy, practical wit that grounds her. (“Being crazy,” Caroline muses, “just did not seem practical.”) When she gets an opportunity to sell cosmetics by a national retailer, Caroline emerges as a natural businesswoman and begins to create an image of herself of which she can be proud. Like many lifelong relationships, Audrey and Caroline’s friendship is a complicated one with hard edges made even tougher by the widening gulf between their paths. Audrey attempts to keep up with Caroline by writing her detailed letters of life in New York that are full of the names and places and sights that enthrall her, but sound like little more than bragging. For her part, Caroline is envious of Audrey and is often quite mean about it. She ignores letters and is condescendingly cutting when they speak. She can never get past the fact that simple Audrey, whom she nicknamed “Poindexter” because of her thick glasses and nerdy ways, has created a new life for herself in dynamic New York City. But we all know that New York is never what it seems. Audrey’s love interest August reminds me of Zora Neale Hurston’s Teacake–a life-altering, earth-moving avalanche of brilliance and charm. In a stunning moment of clarity about their affair (which involves a vicious dog–I interpret this as a nod to Hurston), Audrey returns home to Kentucky. She is lucky, really, to escape with her life. The novel is occasionally affected by slow pacing, particularly in the first half when the girls are languishing in their home towns. The story picks up immediately when Audrey moves to Harlem. Nevertheless, Saint Monkey is an accomplishment for Jacinda Townsend, as she has created a cast of believable and textured characters who speak a language that is natural, rhythmic, and beautiful, especially Caroline’s folksy, hardscrabble mother wit. Eastern Kentucky in the 1950s feels alive and quaint as it pulls on the characters even from afar, living in their dreams and mistakes. Saint Monkey is a beautiful testimony that gives us insight into a critical era of the African American past that many of us reading and thinking about blackness did not live through. This entry was posted in Reviews and tagged Danielle A. Jackson, Fiction Writers’ Review, Jacinda Townsend, Jim Crow, Saint Monkey, The Bluest Eye, Toni Morrison, WW Norton, Zora Neale Hurston. Bookmark the permalink.